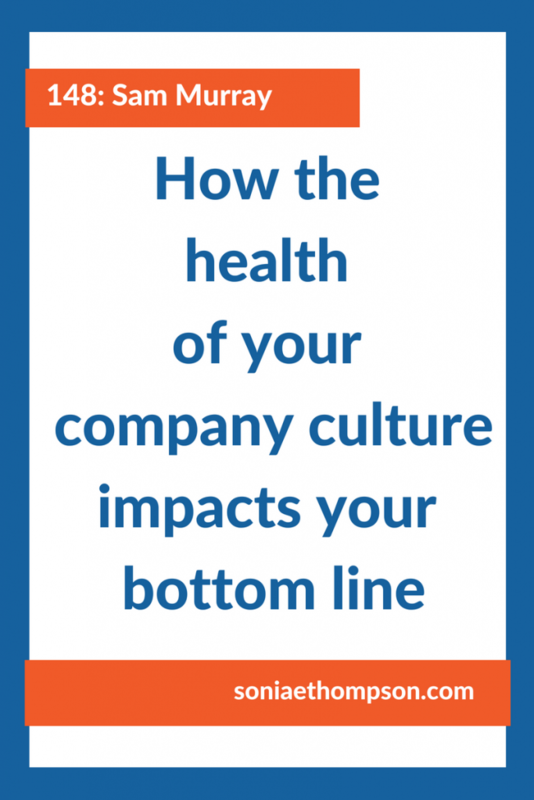 Today we are talking about the health of your company, particularly your company culture and how it impacts your bottom line. And to dive into this important topic, I chatted with Sam Murray, Managing Principal, and Senior Professional in Human Resources at OneDigital, an employee benefits company. We can learn a ton from Sam, in particular how to build a company culture that is healthy enough to deliver experiences that win you more customers. Sonia Thompson: Hello Sam, thank you so much for joining me today. How are you? Sam Murray: I’m great, good morning to you. Sonia: Let’s go ahead and get started and dive right in. Tell me about your business OneDigital. Sam: Well, OneDigital is the largest national benefits insurance firm in the country, and they have an HR consulting segment as part of their model, and because HR and benefits sort of overlap, my background is I started an HR consulting firm over 20 years ago, it’s been a really good fit for us to be part of the OneDigital team. Sonia: Sweet, alright and what would you say is a specific problem that you solve for the people you serve? Sam: Well companies have all different types of initiatives, they have different mindsets on how they wanna run their company so our challenge is always to align with the company’s objectives. Sonia: Okay and aligning with their objectives but is there a specific challenge that they often have that you guys are helping them with? Sam: It ranges from compliance to culture to retention it really is across the board. I would say now we have a lot more inquiries about retaining employees, finding good employees, addressing more consistent culture within the company. Sonia: Got it, got it. These are all hot topics. Now one of the things I know that you addressed often with your clients these days is an inclusive working environment and I’m sure that helps with the retention aspect of it. So just that we are all on the same page what is an inclusive environment and how does it help companies deliver remarkable experiences to their customers? Sam: Well that’s a pretty loaded question. An inclusive environment touches on many areas, it includes various demographics, it includes communication, it includes people at all different levels that have some knowledge of how the company should or is being run and it allows voices from every level to be heard within the company. I think that creates a sort of ownership of your job and how you conduct yourself that the customer experience is enhanced by rather than well I don’t know this is how they do things. Those kinds of answers are not going to create a good customer experience obviously. Sonia: Got it. Now just to about every company these days will say something like we’re all about diversity and inclusion, this is part of our values, but a lot of people actually struggle to live that in practice. It’s one thing to say it, it’s another to actually have a culture that embodies it. Why do you feel that so many companies struggle with this from your experience? Sam: Well I think that having a thoughtful company is a challenge. Your primary objective on a day to day basis is profitability so a lot of companies are just driven by bottom line driven types of decision making. Let’s face it a company is a compilation of just people that have different life experiences, different values, so for people to be thoughtful is sometimes a challenge when you have a busy job that’s just demanding on a day to day basis. Companies don’t often take time out, set aside a day or two days to retreat and really discuss who are we? Where are we going? What do we want to achieve? Sonia: Got it. Now you say a company is made up of individuals and I do think that sometimes people forget that, each employee is a human, is a person. Is it difficult to get the people that you’re hiring to adopt the values of the company when maybe they’ve never thought about this in particular when they’re coming to work for a company, but maybe they have different values, is that something that you feel can be changed with training or is it something that this is how you act when you’re here operating on behalf of our company and what you do in your own time is your own thing? Sam: Well I think a lot of times companies, as you pointed out in your previous question, companies wanna say what they do and what they are, but the employee experience is what they actually do and that really is what culture is. It’s not what you say you’re culture is, it’s what the employee experience is to what your culture really is, but I think employees are hungry to be a part of something that they want to embrace so when a new employee, as you just asked in this question, comes on board how do you get them integrated into hopefully a healthy company culture? It really falls on all of the other employees and to some extent the manager to help shepard that employee in the right direction by saying those aren’t the kind of things we say here, that isn’t the way we behave here. So you begin identifying who you are as a company by the voices of your employees and employees then want to participate in that. Sonia: Got it. I love the way that you describe that. Getting people to adapt to the company culture that you say you wanna have, cause like you said there’s what you say and there’s actually what people do and a lot of getting people to do and live the values and the culture that you want to have within your company requires some training so what would you say from your experience over the years working with different companies is what a good training program might look like to get people to sort of nod their head and say yeah yeah yeah these are values that I can live on a regular basis while I’m here at work? Sam: Well let me get a little bit into the history of training and the area originally started in harassment training, companies were required to that either because it was a defense if there was a harassment complaint the company could say hey we trained them it’s not our fault. That, especially in California, was expanded to discrimination, bullying, all of that is now part of that training requirement, but that has just been on the surface. If these are our policies you have to behave this way. Dealing with employee behavior is fine, but their underlying beliefs is what causes those blips, those Starbucks moments, those Roseanne moments. You can muscle your behavior requirements to a certain extent, but peoples underlying beliefs will pop out. And so I thing we are seeing a shift now in how or what corporate responsibility is really gonna look like in order to participate in the social change that’s needed. Sonia: For sure, now there’s culture change at a social level and there’s culture change in a company and sometimes like you said those things can go hand in hand. Now a lot of times culture change is something that works well whenever it happens from the top down, but sometimes diversity, inclusion, belonging creating these types of environments, creating these real cultures that are embraced sometimes it’s not a company priority because they’re like we’ve got this number to make, we’ve got these initiatives, yada yada yada. So what do you do or what would your advice be for business leaders within a company who see that there needs to be a shift in the culture, but they don’t necessarily have the full buy in from their senior leaders? They’re not opposed to it, but they don’t have necessarily the full buy in? Sam: Well let’s face it everybody has they’re own biases that they come to the table with. What I’m seeing is corporations are going to have to now start talking about that, there’s gonna have to be a discussion on it. But one of the things that my career has sort of evolved into is I often get consulting projects that are around executive level misbehavior so I do one on one trainings with executives. What’s happened even in Hollywood, they had policies, they trained people, but the people at the top are the ones that are the most guilty of that behavior and people see that. Employees recognize inauthentic behavior, and so then pretty soon nobody’s behaving correctly, even though the policy is written. Everybody signs their documents that they are trained, but once you allow it at the highest level it eventually becomes a virus in the company. Sonia: For sure, For sure and I totally agree with you. So it sounds like what you’re saying is you definitely need your company leadership on board, but what leaders have to do within their sphere of influence is walk the walk and talk the talk, eventually everybody can get on board. But what they can control is their own team and how they lead them and they need to be able to live into what they’re asking them to do. Sam: Yeah, that is correct. Sonia: What are you’re suggestions on, first I’m curious if you think this is possible, but for how to gain support of employees who aren’t necessarily on board with diversity and inclusion and belonging especially if they feel threatened by them. Because I know this is a topic that a lot of people don’t necessarily don’t wanna talk about, but it’s popping up and it’s popping up a lot so how should leaders start to address this? Sam: Well I think they have to make it more visible in the company for one thing. Training needs to change. It can’t just be espousing what the policy is and what the requirements is, you have to bring people to a level of awareness of what the impact is. For example, everybody would agree that we need an even playing field, but until people really understand that we won’t have an even playing field and how they participate in perpetuating that so then there’s not gonna be real change or awareness. So your training needs to include real discussion about and real interaction about that playing field and how that looks in environments and how people respond to that when they’re on the low end of that playing field. So those kinds of examples can even be done with simple games where imagine I’m sure you’ve played Monopoly before, imagine when you start the Monopoly game different players are given different amounts of money instead of everybody getting five ten dollar bills and three five dollar bills and all of that if people got different amounts the playing field is not even, they’re gonna have certain advantages. So I think those kinds of examples can really start to bring a different level of awareness of employees to recognize what the know is right, there should be an even playing field. Sonia: For sure. Are there any specific recommendations that you would give employees or leaders of these teams for what their specific role should be in rallying diversity, and creating a diverse and inclusive work environment, because everybody has a role to play right? What are your thoughts on getting people to replace theirs? Sam: Yes. You know as you’ve already identified leadership has to be there and we’re seeing in the HR industry we’re seeing titles change to people in culture and other kinds of contemporary terms to recognize that someone needs to be in charge of continuing to put this in front of everybody so employees don’t fall back into their default of the biases that they learned growing up or whatever. But that it’s constantly in front of them. And so when it’s somebody’s assignment, I think things can actually change when it’s in front of you all the time, when it’s a component of every staff meeting, when their are changing signs, when their are rewards and incentives and things that are all part of a program to help instill the right culture in the company, which will always translate. Health always translates to the bottom line. When a company is not healthy, the bottom line eventually starts to feel that pain. Sonia: I like that analogy because this is all about the health of your company right? Once a company starts engaging in these efforts to transform their culture to be one that’s diverse and inclusive where everyone feels like they belong, how will they know that it’s working or that they’re making any progress, cause I imagine that these are gonna get difficult and uncomfortable and maybe they might feel like it’s not working at all so how do they know when they’re moving the needle in the right direction? Sam: Well companies for a long time have done employee satisfaction surveys and I think that is still a very useful tool, but it’s the questions that are asked in the satisfaction surveys that need to change and need to be more raw, more open, more direct to these types of issues, but I also like random interviews. I know that sounds a little awkward, but imagine in a company you have Chief Culture Officer okay and there job is to monitor that things are on track and continuing to be progressive and moving in a good direction, in a healthy direction to be tapped and to say I’d like to interview today as a rank and file employee and talk to them about what your experience is, what you think we can do differently, how could you be more included and one on one people are a lot more comfortable sharing things when they feel that it’s welcomed information. So I think surveys are helpful as a whole and it does give you data, especially in a large company. But just like they do random drug tests I really think random check in with employees could really be powerful. Sonia: For sure I totally agree. This has been super insightful, if people want to learn more about you and the work that you’re doing where can people find you? Sam: Well my email address, would you like that? Sam: Well my name Sam Murray, S a m M u u r a y, and I am on LinkedIn, but my email address is simply smurray@onedigital.com. Sonia: Sweet, and I’ll put that info in the show notes in case people wanna reach out and they wanna find you easily. Sam: Yeah I’d be happy to direct them to a solution that will help them with what they’re trying achieve. Sonia: Well any parting words of wisdom for business leaders who wanna create a culture of inclusion in their business so they are able to be a healthy company to deliver those remarkable experiences to their customers? Sam: Well I guess in summary I would say to business leaders recognize that things are changing and corporations are going to have and already starting to have a different kind of social responsibility than they have had in the past, it’s not just charitable they really are gonna be held because of their own reliability they’re gonna be held to creating environments where bias is minimized and healthy views of the world that we live in exist and that is gonna be a big responsibility and that is gonna require an ethical balance to how they use that responsibility, it’s sort of scary putting that in the hands of corporation in a way. We’ve always relied on families to provide our values, but I think corporations, business in general are going to be playing a much bigger part in that role, but you have been delightful and than you so much for listening to my views and my experience that I’ve gained in my career, so thank you. Sonia: Thank you so much. It’s been great talking to you.